Here at Kenley Revival HQ we have never been short of surprises. Whether it be the stories of those who lived, served or played at RAF Kenley during the Battle of Britain to the very fabric of the site’s architecture itself. As part of our conservation programme, the blast pens will have the soil machined off in the middle to expose the concrete casings of the air raid shelters. This then allows us to assess the condition and to ensure the concrete is conserved in order to protect it for future generations. As such we have recently exposed the concrete casings of three blast pens in the North East end of the airfield to rather dramatic results. These concrete structures have not been exposed since they were built by April 1940 when the airfield was fully operational. 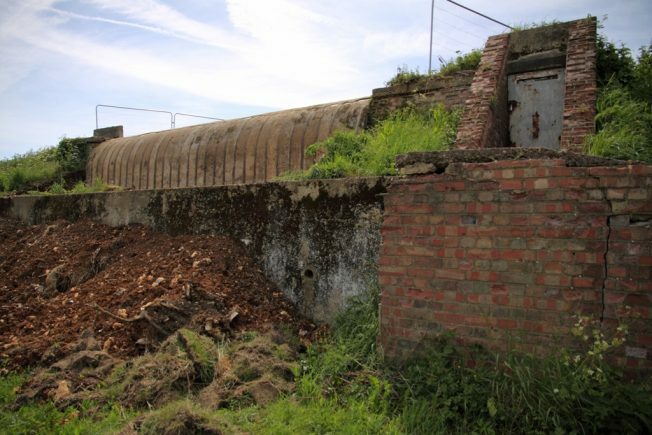 The unique defence architecture of RAF Kenley, along with its surviving completeness makes it the most intact fighter airfield from World War II. If you haven’t been to Kenley Common recently you may be surprised by the amount of progress that has been made to the conservation of the Zone 2 side of RAF Kenley. Zone 2 includes the three pens nearest to the fuel dump of the North East side by Whyteleafe Bank. These pens also include our highlight blast pen where the original spinewall is still intact allowing us to recreate this structure in the RAF Kenley tribute blast pen once the tribute has been relocated forward. By exposing the concrete our conservation contractors can then assess the actual condition, complete any concrete repairs and then put the soil back on. 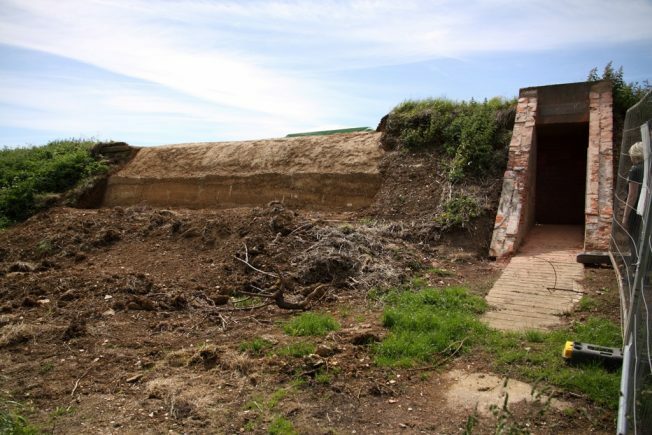 We aim to keep as much of the original material as possible including the soil as this was as important as the bricks and concrete in sheltering the planes and people from the bomb blasts which would have occurred and absorbing the shocks of the impact. By exposing the concrete to this level we’re also able to see just how widely different these blast pens were built which despite the fact they were all built during the same period and to the same ministry of defence plans they widely vary in size and construction with no clear reason. 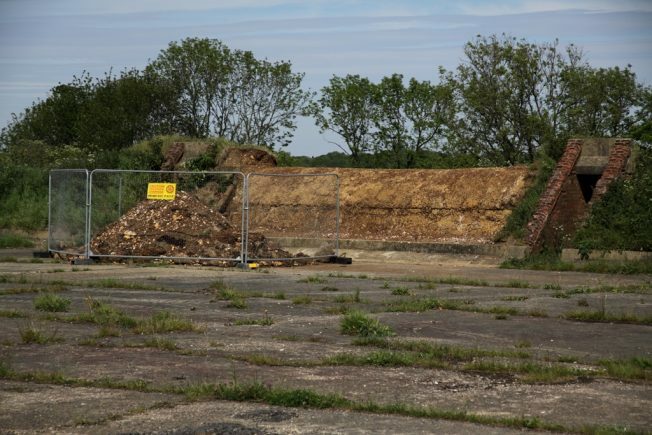 We believe this could possibly be due to a call out to local brick merchants and builders to donate materials and build the structure as the call for it to be turned from an aircraft acceptance park to a fighter airfield came so quickly with the arrival of World War II. This pen shows that it was constructed using pre built concrete rings which were a half circle which were then slotted together and glued together with liquid concrete between each other and on top. This pen shows that it was built with a poured concrete wall from which concrete was poured directly from the top which shows it was built entirely during its construction rather than from rings would have likely been built away from the airfield. This pen also have freely poured concrete but also looks like it might have a double layer of concrete which also has a different composition in terms of aggregate to the concrete used in the other pens which also use their own different mixes. Either way it’s certainly been an interesting discussion for us here at Kenley Revival HQ with our conservation contractors, architects and Historic England! If you know anything the history of these intriguing structures do get in touch with us. Please note that the pens will be restricted in terms of access as our works are underway so please do observe any signs or instructions from our conservation contractors. We will be hosting tours of the works as part of our ‘Walk and talks’ which are held monthly over the spring and summer. To find out how you can join these sessions and hear more about the project sign up to our newsletter.